If you prefer to complete the forms at our office please allow 30 minutes prior to your appointment time. Your physician’s written prescription/referral to physical therapy, insurance card, patient information forms, photo ID, and a list of any current medications you are taking. Wear comfortable clothing that is easy to move in. Footwear should be athletic and closed toed. Plan one hour for your first appointment. You will be evaluated by a licensed therapist to establish problem areas and to collaborate with you to set functional goals and to establish a plan of care. This visit usually includes instruction of a home exercise program for you to follow. You will need a referral from your physician or medical provider (primary care doctor, nurse practitioner, orthopaedic surgeon, podiatrist, etc.) for insurance to pay for your physical therapy treatment. Tucson Orthopaedic Institute therapy services will accept an initial referral from your provider by fax, mail, or in person. Once we receive the referral, we will be happy to schedule the initial evaluation. Sorry this is so tardy- but I wanted to make sure you know how much I appreciate you helping me recently. You are the BEST and I was fortunate to get your help. Thank You! 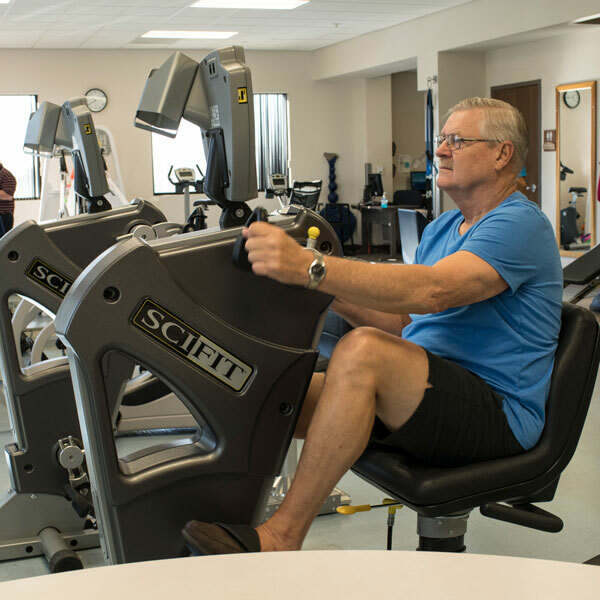 - Mark V.
Checking people in and checking appointments has little room for glorious behavior, however, your staff has made those simple necessities a major part of the physical therapy experience. Being greeted by name and given a broad smile goes a long way toward healing the pains. I have come to look forward to entering physical therapy so that I can receive a big hello and smile from Sarah. She is terrific and a model of how to do that job effectively, putting psychological patient care into the forefront of herself developed job description. Congratulations and thank you, Sarah, for making a difficult time as pleasant as you could for me. I, and many others like me, all need to thank you for the extra effort you put into your job. As a retired Tucson hospital RN who worked in the ICU, I was familiar with the various auxiliary caregivers that worked with my patients. When I came to Tucson Orthopaedic with shoulder pain, Dr. Scott Goorman recommended physical therapy. I appreciated [my therapist’s] expertise, her clear explanations of what was involved in what she explained was bursitis. Her manner was calm, assured. I went to three different sessions with her, and my range of motion improved considerably. I feel she is an exceptionally gifted therapist and recommend her wholeheartedly. I tried the lymphedema therapists at TOI after a very bad experience with another facility. Lori and Angela are the kindest, sweetest and most talented gals and I am so grateful for everything they have done for me! The check-in procedure is easy and the waiting room is pleasant. The therapy facility is exceptional. I highly recommend Tucson Orthopedic Institute to anyone needing help! I visited the physical therapy department recently and could not believe the excellent service. Everyone was wonderful. The receptionist was so professional and knowledgeable. There was no rushing to get through the admittance and she answered all of my questions with a smile. [The physical therapist] was very caring and professional. He spent an hour with me and didn't seem rushed, answered all of my questions and was very thorough. While I waited for the appointment, I requested to speak with Diana, the Patient Services Manager. I was most surprised to have her come immediately and speak with me. That was unexpected. I am so impressed with her. She is very professional and listened to my requests. Overall, I have been very pleased with Tucson Orthopaedic Institute and the level of care provided to the patient. Thank you. The meeting with the physiotherapist was just outstanding! Very professional and thorough; they helped me understand how the body works - or doesn't. I am impressed. Hoping the subsequent visits prove as useful. Looking forward to the therapy sessions. I would definitely recommend to others. Tucson Ortho physical therapists Angela, Cheryl and aide Tyea are sensational representatives of Tucson Ortho! They are professional and caring and I'm grateful that they're determined to help me be pain free. I have been coming to Tucson Orthopaedic Institute for a year for physical therapy. I have seen Cheryl Garcia, PTA and Rick Devore, PT and am pleased with the therapy they have provided. They are very knowledgeable in their treatment procedures and have given me good relief from pain and stiffness in my neck and back, as well as good exercises to practice at home. The front desk is pleasant as well. I have been to many doctors, as well as many physical and occupational therapists with little to no results. I was thinking that maybe they will never find out what is wrong with my body. After a few doctors, one referred me to Tucson Ortho, and after a few visits I feel so much better. I am able to perform my daily activities with very little or no pain, which to me is very important because pain is your body telling you something is not right. Thanks to physical therapist, Rick, and his expertise, I'm now able to walk pain free. There is no other place that I will go and suggest Tucson Ortho on Grant and Craycroft to all my friends and family. Thank you Rick and thank you Tucson Ortho! I was extremely impressed with the therapy dept. at TOI. I had previously had knee replacement and had PT at another location. This go-round was much more professional and I felt confident in their ability. The staff were all very knowledgeable and made me feel comfortable and it was a very pleasurable experience all the way around. I will recommend them to anyone I know having orthopedic surgery in the future.